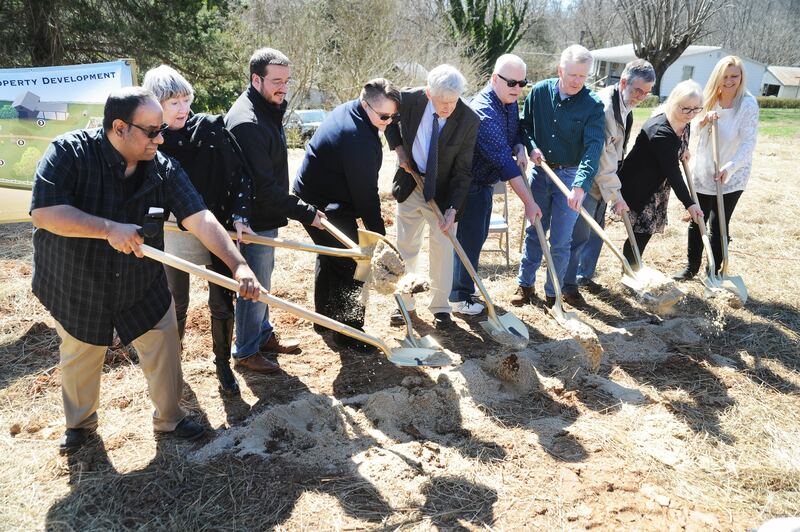 ©2018 Blue Ridge Life Magazine : Photos By BRL Mountain Photographer Paul Purpura : Ray Castro (L-organizer and co-founder of Earl’s Meadow) along with relatives and dignitaries makes the ground breaking of Earl’s Meadow official this past Sunday – March 4, 2018 in Schuyler, Virginia. 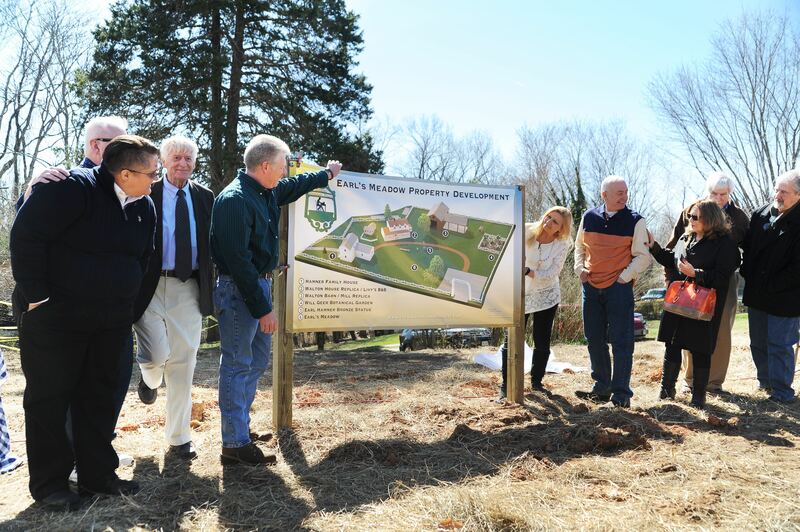 In a move to keep the memory and legacy of Earl Hamner alive, the official groundbreaking of Earl’s Meadow took place this past Sunday in Schuyler. That’s the birthplace of Earl Hamner, Jr., the creator of the highly popular 70’s CBS television series, The Waltons. The show was based on Hamner’s childhood experiences growing up in Schuyler. Earl also wrote many articles and poems in our magazine when we first started back in the mid 2000’s. He died two years ago this month in March of 2016 at the age of 92. “We expect the replica to be completed by Fall 2018 and Earl’s Meadow to be completed in 2019.” Ray Castro tells us. He and business partner Carol Johnson are developing the project. They bought the original Hamner family home last year and have turned it into a museum. 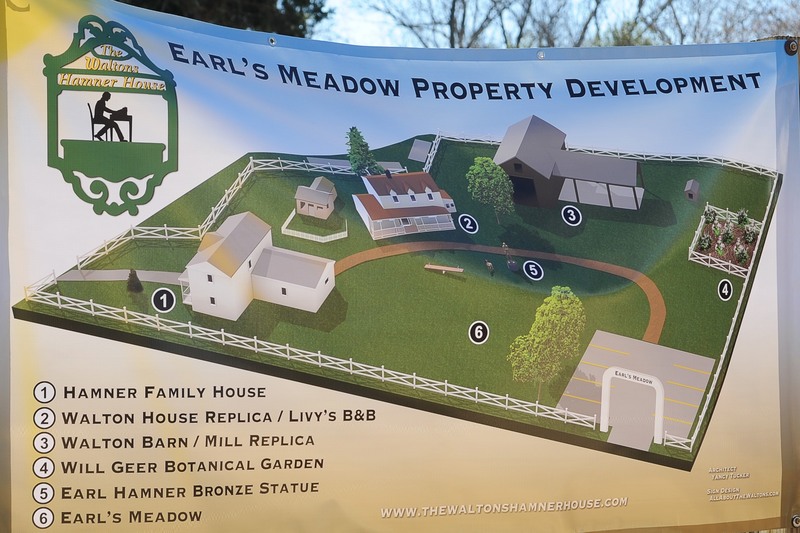 Plans for all of Earl’s Meadows were unveiled at the groundbreaking. Sunday – March 4, 2018. A closer look at the different phases of Earl’s Meadows. Castro and Johnson purchased the property known as the Giannini house nearby to the old Hamner home. They determined the house was in such bad shape that it was eventually leveled and plans for Earl’s Meadow began. Leona Roberts (R) of Walton’s Mountain Museum looks on during the ceremony. James Bond plays the bagpipes at Sunday’s ceremony in Schuyler. Pastor Jon McCranie speaks during Sunday’s ceremony held in Schuyler. Nelson County BOS Jesse Rutherford makes remarks during Sunday’s ceremony in Schuyler. James Bond plays the bagpipes at Sunday’s ceremony as Nelson BOS Rutherford looks on. Founders, family, and dignitaries get ready to scoop the first shovel of dirt at Earl’s Meadow in Schuyler, VA.
You can learn more about the plans surrounding Earl’s Meadow and details on another reunion of The Walton’s stars planned this summer in June by heading over to The Waltons Hamner House on Facebook.